lunch for one. tomato and celery salad with shaved baby fennel and dill flower. I am working from home today, and found myself making my go to summer salad for lunch. It is super similar to theone I made a few weeks back but tastes surprisingly different with just a couple substitutions. There really is no recipe, it is just thrown together based on whatever I had in the house. I can't seem to get away from this tomato celery combo this season... it is so good! This salad was a melange of tiny summer tomatoes. I picked up a couple of mixed quarts of them at the Union Square Green Market along with some fresh dill flower, baby fennel and my favorite red celery. I went to my trusty mandolin for perfectly thin celery and fennel. It is my favorite kitchen tool hands down. I have a really good French mandolin but I prefer a simple Japanese one (I use one fromMUJI) I use it through all the seasons! You can also find nice Japanese ones at a Japanese hardware store or a Japanese Mart. 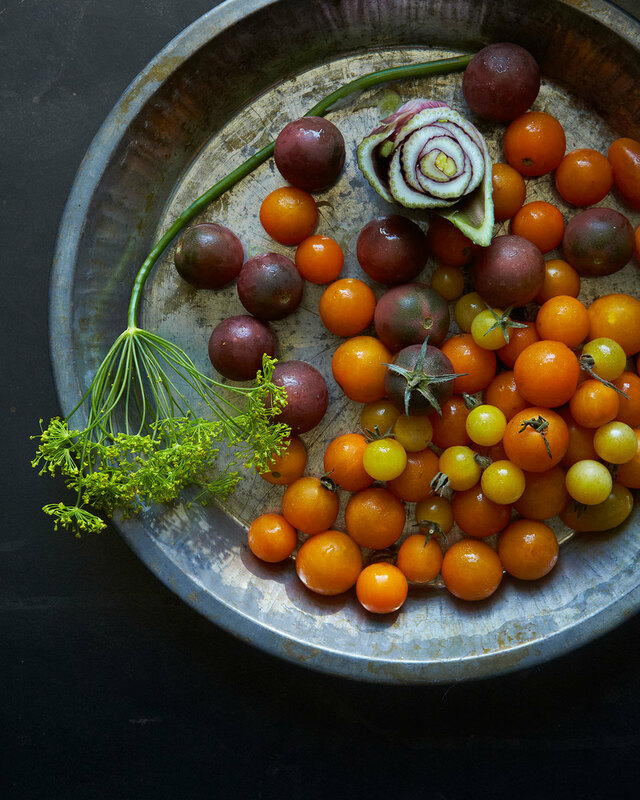 I hope you are inspired to get the Greenmarket and make a version of this salad. Add a little fresh goat cheese if you would like to make it a bit more substantial. Lunch For One ; Tomato and Celery Salad with Shaved Baby Fennel and Dill Flower. Top off with a little crunchy seas salt and toss the whole salad. EAT. SMILE. EAT SOME MORE.